Keep It Simple and Fast: Microsoft SQL Server 2008 R2 System Views Maps. Microsoft SQL Server 2008 R2 System Views Maps. To better understand the relations between all system tables and system views, a nice map is published which visualize all these relations. 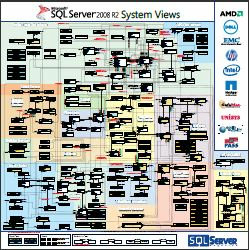 The Microsoft SQL Server 2008 R2 System Views Map shows the key system views included in Microsoft SQL Server 2008 and SQL Server 2008 R2, and the relationships between them. Why is my keyboard changing to another languages? SQL Denali Codename Crescent what is it?